My coaching conversation with Mark covers some really deep topics, and I am really grateful to Mark for his presence and willingness to be open, to go deep, and to let me share this recording of our coaching session. We hit on three key ideas that are worth looking at in your own work! The meetings you have, the conversations you can and can't have IS the organization you are in. If you can change the way you meet, the way you converse, you can change how you organize. Opening is the creative divergence that loves to bring new ideas to the table. Exploring is the creative emergence, which allows ideas to breathe and grow. And Closing is the creative convergence, the comfort with eliminating choices, aligning and delivering on ideas. Mark is an Explorer. He likes to talk things out, to let things emerge from the soup of his creative process. Closers, particularly , find that mode frustrating, wasteful and confusing. Closers like to land the plane, to figure things out, to end dialogue. We all need to design invitations with the creative tendencies of other people in mind. Mark wants others to understand his creative energies and help him support and shape them. But he needs to frame the process as an invitation into a finite game. In my work, I find that people are willing to try something if they know that they can end the game anytime they want! Mark also wants others to support *his* mode of thinking, but isn't thinking about how the other people on his team might be thinking the *exact* same thing! So, the rules of his game, the game he wants to invite people into, we could call the "give me your energy, attention, benefit of the doubt and tolerance for my creative modes" game. That's a big ask, and totally unilateral. His job is to find a way to include other people in the process, and to make the rules of his game apply to everyone. That's an invitation that people can get behind. 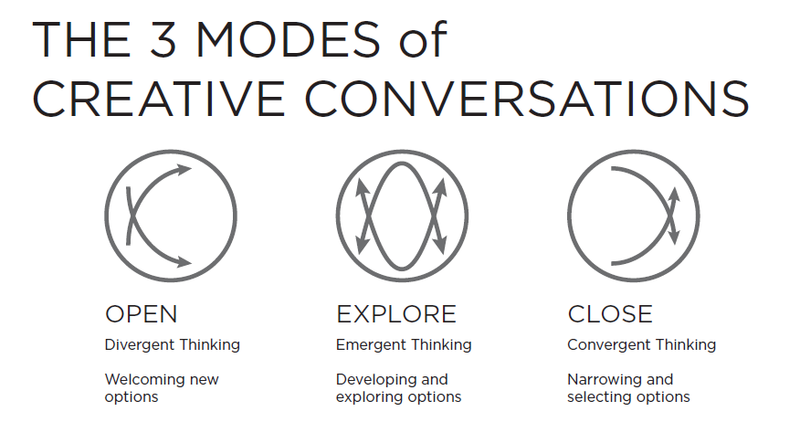 That's the art of conversation design! As Mark says, he needs to learn how to be with others in a way that isn't" just launching into my mode without preparing people for the rules of the game" and he needs to do it in a way that feels natural, not in a way that requires him to invert his approach, to turn himself upside down and inside out in order to work with others, which is what he's doing now. And it's killing him. Treating every conversation like an experience, he has to *design* the invitation into the experience in a way that resonates with his partners. The question we start with, can a public purpose organization be more agile, becomes "can a purpose driven person bring the energies needed for creative transformation?" And that question, I believe, requires individuals in the organization to be agile, to be comfortable picking up the creative energies required for the moment, for themselves and for those they work and play with. Organizational agility totally and completely counts on people who can be agile in their movement between the creative modes and who can frame shifts in those modes as invitations.